A big downtown Tacoma development plan is among the projects for which Chinese companies are soliciting EB-5 investment funds. U.S. firms claim the Chinese competitors have an unfair advantage. 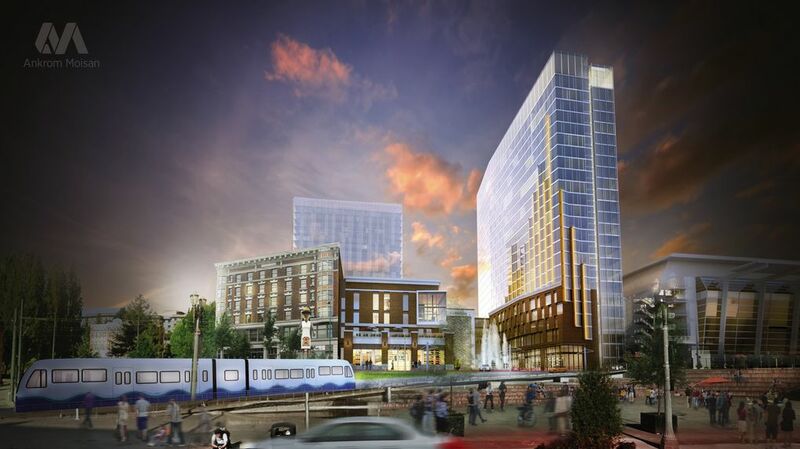 Tacoma’s City Council, seeking to invigorate the downtown area with a big hotel next to its convention center, recently struck a development deal with the U.S. subsidiary of a Shanghai real-estate firm. The proposal for a 350-room hotel and a 200-unit residential tower was the only one of five bids that sought no city subsidies or incentives. “Seems too good to be true,” one city councilman gushed. One reason Chinese companies can raise capital from Chinese investors for such U.S. projects on attractive terms is an extra benefit: green cards for the investors to live in the United States. A growing number of the firms raising capital through the federal EB-5 visa-for-investment program are China-based, say experts such as Elizabeth Peng, founding partner of Peng & Weber, one of Seattle’s leading immigration-law practices. That has set off complaints from U.S. EB-5 promoters who had been the only channel for well-to-do foreigners eager to enter via the visas. They warn darkly about the possibility of fraud. And U.S. developers using EB-5 money say it’s not a level playing field: China-based enterprises can use the visa program here, but U.S. companies themselves can’t solicit investors there. And billboards at Beijing International Airport. Peng says about half the applications her firm is handling to establish new EB-5 investment centers come from China-based individuals or companies. The U.S. promoters’ concern is really about competition, she said: Chinese companies can have lots of cash, as well as deep personal networks in China to raise capital and cut out the middleman. “You have cash, you have power in this market,” Peng said. Tacoma’s deal is with Yareton Investment Funds, an EB-5 funding operation in Des Moines that’s owned by Shanghai-based Minqiang Investment Group (MIG). Yareton received federal approval last year. Its principals are Albert Sze, a U.S. citizen, and Chun Yang, a Chinese national who founded MIG and has a home in Medina. Sze, Yareton’s manager, said that without the EB-5 visa program, Yareton might not be able to pull off the convention-center hotel project. The company has two years to obtain permits and sign a hotel operator. After that, it will be able to buy city land next to the convention center for the project. U.S. developers using EB-5 money say it’s not a level playing field: China-based enterprises can use the visa program here, but U.S. companies themselves can’t solicit investors there. Sze says half the $170 million project will be funded by 190 EB-5 investors, mostly from China, with the balance coming from MIG and a bridge loan. Yareton already has begun construction in Des Moines on a 235-room Four Points by Sheraton hotel it expects to open in August. Nearly 60 EB-5 investors are contributing just over half the capital needed for that $50 million project. Sze said Yareton hopes to open the convention-center hotel in 2018. The project would create more than 1,000 jobs locally, he said. The main headwinds facing Yareton in pulling off the project are the limited availability of EB-5 visas for investors from China as well as the sheer number of U.S. projects jockeying for them — the same challenges for regional centers owned strictly by Americans. “There’s too many competitors, too much product out there,” Sze said.